Prepare current assets section of the balance sheet of Husnain company. 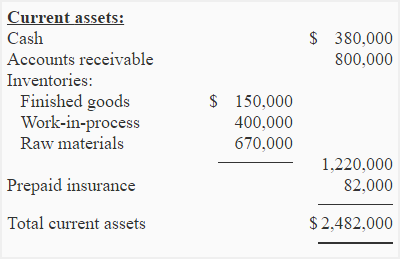 Notice that Hussnain manufacturing company reports three inventories (finished goods inventory, work-in-process inventory and raw materials inventory) in the current assets section of the balance sheet. Merchandising companies report only one inventory that is ‘merchandising inventory’.